I covered her in clear spica glitter for some extra flash and shine. Love your coloring and the pearl. Oh wat a beautiful card Becky. Love your colouring and the glitter and those shades of pink you've used as the background are just gorgeous!! Can't wait to see what you'll do with tomorrow's sneak peek! that is so cute ;) love the colors!! oooo, this is really pretty Becky. love the pearl and the glittery tail you gave her. Cute cards! I love the partial scallop on this. Why do I never think to do things like that?! Your other cards are adorable, too. That DP on the turtle card is perfect! Oh Becky it is beautiful!!!! I love your coloring and all the sparkle! What a great idea to use that wave punch! So, so awesome and the layout is perfection! Oooh, love all the pink, Becky!! Such a gorgeous card and beautiful coloring!! I love the half circle scallop!! It reminds me of a sea shell! You did a wonderful job with today's sneak peek!! I just love that color combo!! Very pretty!! Can't wait to see what you come up with for tomorrow!! Whoohoo!! So cute! I love the pink on her, and the glitter on her tail. She is so sweet! I really love the color combo, too, and the wave you made behind her. An adorable card Becky! 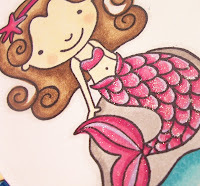 Love this mermaid and your colours are fantastic! She is Gorgeous Becky!!! Gorgeous!